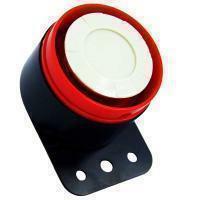 KS-82P Piezo Siren is not to be overlooked. Despite its small size, this siren is capable of generating loud sound to alert others nearby. Sturdy housing construction ensures it is free from normal physical damage. Variety of colors are available to choose from to match your surroundings. Multiple tones available to choose from for various setting. Tone: Siren, marine whistle, hi-low, etc. *****We welcome any OEM/ODM designs/specifications you would like to develop for this product.